Evaluation Capacity Building (ECB) is an intentional process (of learning, training, mentoring, coaching, resouces development etc) to support individuals, groups and organisations to learn about what constitutes effective, useful, and professional evaluative thinking and practice, in order that they are able to effectively undertake and use evaluation in their day to day decision making, in ways that improve, adapt and renew what they do, for the benefit of the people they work for and with. Increased ability to renew and continually adapt and achieve sustainability. The diagram below summarises the ‘system’ of evaluation capacity that might be the target of capacity development processes and activities. 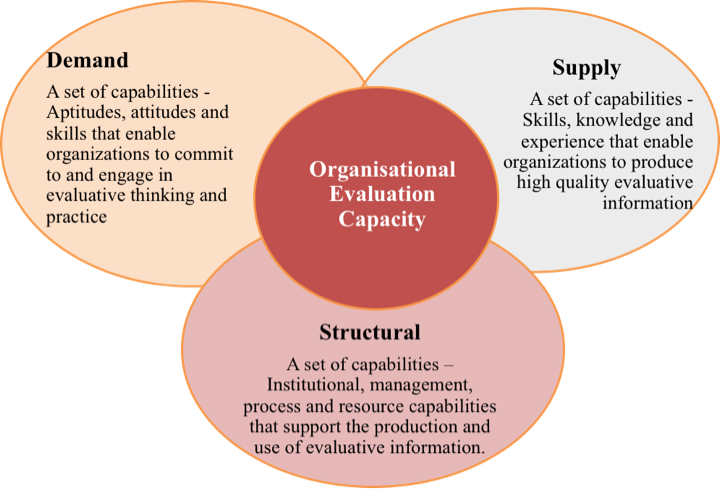 The ‘system’ of evaluation capacity in any organisation is made up of a suite of capabilities – knowledge, skills, experience, attitudes, structures, leadership, motivations and expectations about evaluation its consequences. Evaluation Capacity Building needs to be tailored and designed for the context in which it occurs. The effectiveness of ECB is highly dependent on the organizational context, in particular the leadership, organizational culture and the systems and structures that are in place to support evaluative thinking and practice. Not surprisingly, evaluation capacity building or development depends on the level of ownership, commitment and motivation of the people involved, i.e., their ability to commit and engage in the process. People in organisations who are determined to develop their capacity will overcome all sorts of constraints and obstacles, while those with less resolve will make little progress. ECB is developmental and relational, it takes time, and requires relationships of trust to be developed and embedded in the process. So, the design and implementation of an ECB process is most often an adaptive one, rather than being tightly specified up front. This first phase involves clarifying everyone’s expectations and motivations for ECB; clarifying the levels of understanding, skills, experience and knowledge people in the organisation have about evaluation; orienting key people in the organisation to evaluation and evaluative thinking and practice. Typically these are developed collaboratively, usually in one-to-one sessions, and workshops. Coaching or mentoring – more individualized provision of technical and professional support. Decisions about what will work best will need to consider the resources and time that is available to people in the organisation, as well as the preferred and relevant learning strategies for those involved. learning is able to be applied and transferred. 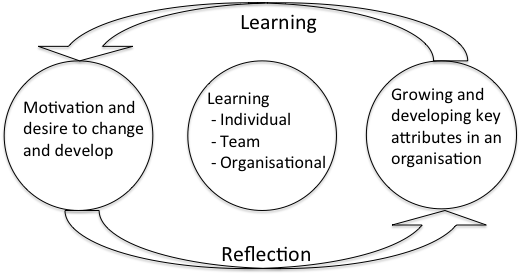 For this reason, the implementation process needs to build in a reflective learning cycle, so that the ECB process can be adapted when needed, and that it continues to meet the organisation’s needs.